The quota of private tour operators sending Haj pilgrims to Saudi Arabia won’t be increased from 2018. NEW DELHI: The quota of private tour operators sending Haj pilgrims to Saudi Arabia won’t be increased from 2018. The Ministry of Minority Affairs has now decided not to include the high-level committee’s recommendation of increasing by over 3 per cent the quota of private tour operators (PTO) from this year. The ministry has also conveyed its decision to the Supreme Court on whose order the new Haj policy is being formulated. The government’s decision has come after the Haj Committee of India opposed the special panel’s recommendation. Union Minority Affairs Minister Mukhtar Abbas Naqvi confirmed that the quota of private tour operators vis-a-vis the quota of Haj Committee of India (HCoI) would remain the same for Haj 2018. The special panel had recommended that the quota of PTOs be increased from the present 26.47 per cent to 30 per cent. 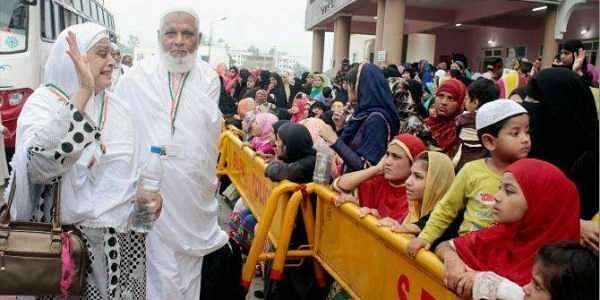 India has an annual Haj quota of 1.70 lakh. “For 2018, we have decided to maintain status quo with regards to pilgrims going for haj through HCoI and PTOs. The minority affairs ministry along with the law ministry is examining what should be done in future,” Naqvi said. Earlier, he had said that the special panel’s recommendation of increasing the PTOs quota had been accepted by the ministry. The HCoI sends pilgrims to Haj through two plans—Azizya and the green category. In 2017, Azizya cost Rs 2 lakh and green category was for Rs 2.34 lakh. Haj through PTOs costs anything between Rs 3.5-10 lakh. The government has made it clear that there would be no Haj subsidy from 2018. The subsidy was in the form of discounted air fares.